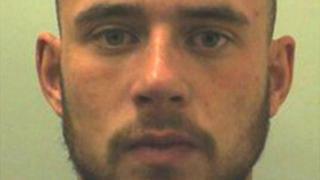 A love rival who stabbed to death a professional cage fighter whose pride was hurt when he lost a wrestling play-fight has been jailed. Dylan Slater, 26, and Tarro Grogan had children by the same woman and firmly disliked each other, a court heard. Following a dispute at a house gathering in Blackburn, Lancashire, Slater killed Grogan, 29, with a "full thrust" knife blow to the chest. He was jailed for eight years and three months at Preston Crown Court. The court heard the killing happened in the early hours of 14 October last year, when Slater visited a friend's house in Peridot Close but did not know Mr Grogan was due to arrive. The men had "faced off" in the living room in a supposed play fight in which the loser was supposed to "tap out" in submission. When Mr Grogan lost, he demanded a rematch or a real fight and angrily followed Slater into the kitchen, the court heard. Slater then pulled a flick-knife from his pocket after fearing Mr Grogan would take retribution for being so baldy embarrassed in front of friends. In response, Mr Grogan picked up a knife from a kitchen worktop before Slater armed himself with a larger kitchen knife, which he used to inflict the fatal blow. The court heard both had been drinking vodka and taking cocaine, while Grogan was someone who could be "violent and intemperate". Sentencing Slater, Judge Mark Brown said the case was "yet another example of the devastating consequences of knife crime". Slater had been in a nine-year relationship with Natasha Scott and had two children with her, while Mr Grogan had a more recent relationship with Ms Scott and had one child, the court heard. Slater told detectives he had acted in self defence and that Mr Grogan had slept with his girlfriend while he was in prison. But Judge Brown said it was Slater who was the first to produce a knife, which "escalated the stakes considerably". He said the background of ill feeling between the pair then "got the better of you". Slater had been due to stand trial for murder but the prosecution accepted his guilty plea to manslaughter. John Jones QC, defending, said Slater was remorseful and had shown his regret, and had also asked for an ambulance to be called.